A 163-foot yacht worth 40 million dollars that belongs to Education Secretary Betsy DeVos has been damaged after someone set it adrift from its dock and it subsequently collided with nearby structures. 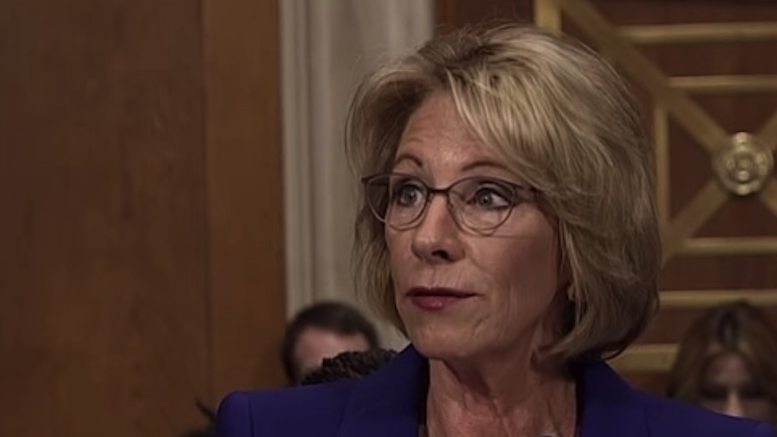 The damage due to scraping is estimated to be between $4000 and $10,000, though DeVos is said to be far more concerned about the prospect of losing the entire craft if it drifts too far. Such a loss, DeVos claims, would be a major inconvenience as she would then have to raid the kitty jar to buy a new one. Initial suspicion fell on a local black bear, who was known to frequent the shoreline and was a vocal critic of DeVos due to her well-known anti-ursus opinions. However the animal has since been cleared after time-stamped CCTV footage placed him near a dumpster on the other side of town during the period when the act was carried out. Update: DeVos said she is no longer all that concerned about her yacht anymore, as the world is set to end anyway during Friday’s Blood Moon. 1 Comment on "Education Secretary Betsy DeVos Concerned Adrift Yacht May Fall Off Earth"
Go Betsy! Finally a voice of reason!